Jefferson serves as the ambassador to Ashe County. It is a role we assume with pride. Recreation and relaxation are a natural part of our DNA with hiking, canoeing and fishing as favorite pastimes. The arts feed our souls, reflecting our heritage and honoring our talents. From the Christmas in July celebration to the Ola Belle Reed Festival and the annual Ashe County Fiddler's Convention, Jefferson applauds the wealth of recreational and entertaining opportunities we offer. Our own hamlet provides walkways for strolling and Foster-Tyson Park - a hotspot for walking, resting and relaxing. The Blue Ridge Parkway, the most heavily traveled National Park, is a short drive from Jefferson. 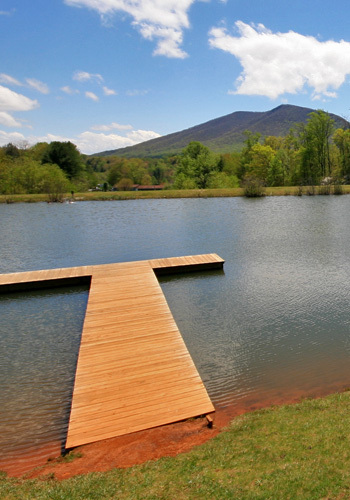 The New River State Park and Mount Jefferson are popular destinations for campers, hikers and naturalists. “Canoeing the New” is a perfect activity on a hot summer day with the Waggoner Road Access of the New River Park a convenient spot to begin your river journey. The New River is the world's second oldest river and a National Heritage River, dedicated by President Clinton in the 1990's. Fish our many trout streams or hit the links at Jefferson Landing and Mountain Aire. Disc Golf at Ashe County Park or bring your skate board to the park's challenging skating course. Pack a picnic, then follow the Ashe County Barn Quilt tour. Enjoy one of our Heritage Farm tours or visit the Ashe County Farm Museum as well as the Museum of Ashe County History, located in downtown Jefferson. Breakfast at the famous Shatley Springs before visiting the Ashe County Farmer's Market or the Blue Ridge Market and More. Join us in November or December for our Choose and Cut season. Take home a tree from the fields of one of our many Christmas Tree Farms. Shop in our community, dine in eateries, visit our galleries,sleep in our accommodations. Enjoy our sights and sounds. We welcome you anytime! Visit the Ashe County Chamber of Commerce and the Ashe County Arts Council websites for detailed information and an annual calendar of events.